The idea of a long drive has been haunting me for quite a while now. Far away from noisy and congested city streets, a long and desolate road with greenery on both sides which will instantly remind me the song 'country roads' is all what I was contemplating. Last weekend, I finally got the chance to live my dream, went out for a long drive to an unknown destination and enjoyed it to the fullest. Yes, I did overcome the fear of sudden breakdown as I availed comprehensive roadside assistance for free while buying my car insurance online at GIBL. 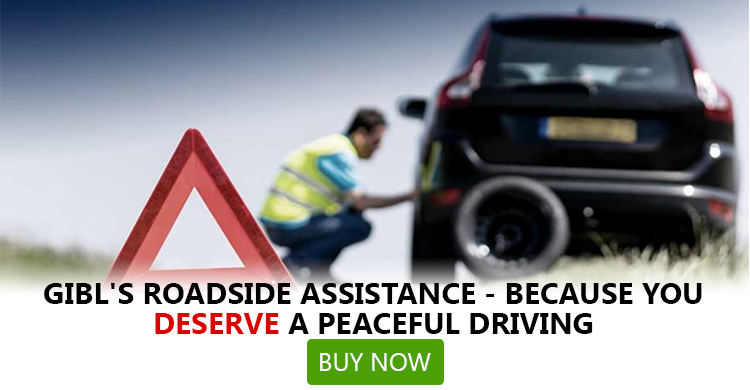 Free roadside assistance – a dream come true for car-owners in India! Car breakdown is not an alien for majority of car-owners in India, including me. Like many other car-owners I also faced the same and went through a lot of trouble to get my car back in shape. To combat this issue, many car insurance companies in India have come up with an add-on cover called roadside assistance that policyholders can avail by paying an additional premium. However, these covers come at a price too. So, I was looking for abetter option and finally I got it from GIBL – a free roadside assistance cover for the first time in India. Now, you don't have to pay when you are stranded in the middle of nowhere and in dire need of roadside assistance. What are the services you will get? GIBL provides all its car policyholders with a myriad of services as free roadside assistance. The coverage of assistance, however, depends on the type of car insurance online plan you have. While all motor insurance policyholders are eligible for the regular coverage on offer (the coverage I got and made the most of) ; the rest with high-end cars are entitled to enjoy wider coverage. Let's start with the regular coverage that GIBL has made available for all. Let's go deep and find out the services that are available under each type of assistance. In case your car suddenly stops moving due to any technical failure you can resort to on-phone assistance. You will get the necessary breakdown support over phone. And, this facility is available all over India as well. Sometimes on-phone assistance doesn't suffice and you need assistance right on the place where your car is struck. GIBL has facilitated that for their customer too. By availing an online auto insurance plan you can enjoy the following on-site services. You, however, need to keep in mind that services are free but products are not. For an example, you will get the service for wrong fueling for free but you need to pay the cost of fuel and in case of towing, the garage and mechanic expenses need to borne by the policyholder. Even if the on-site assistance fails to fix your car and you cannot get started to complete your journey you can resort to towing assistance. GIBL provides auto insurance online policyholders with two types of towing assistance services. If the engine of your car stalls due to electrical and mechanical breakdown you will get one way towing assistance up to 40 km (garage to garage). If your car meets an accident and stops moving any further you can opt for one way towing assistance up to 40 km (garage to garage). When you car goes through a major breakdown but you cannot afford to remain stranded for long you can make the most of mobility assistance. Under the regular coverage, you will get an allowance up to Rs. 500 to hire a taxi in order to reach your destination. In a nutshell these are the services you will get as roadside assistance under the regular coverage if you purchase auto insurance plan online at GIBL. Let's find out what's in store for high-end car policyholders. While the benefits under first two types of services are identical to the benefits available under regular coverage, high-end coverage available at GIBL offer some additional advantages in towing and mobility assistance. Let's start with towing assistance. Under high-end coverage, 3 types of towing assistance available at GIBL. If your car stalls due to electrical and mechanical breakdown you will get one way towing assistance up to 200 km (garage to garage). If your car comes across accident you can opt for one way towing assistance up to 200 km (garage to garage). 3. Vehicle repatriation service In case your car suffers from major breakdown during a long distance journey you can ask for this for for this assistance. Upon intimating your service provider your damaged car will be repatriated up to 200km. Mobility Assistance Under the high-end coverage policyholders can avail 3 types of mobility assistance services. The scope of availing service is much wider when it comes to mobility assistance for high-end car policyholders. If your car comes across a major breakdown you will be rendered compensation up to Rs.1500 for booking a cab to get going and arrive at the place you meant to. What happens if your vehicle ceases to move during a long distance journey? If there is a major breakdown, your car will take time to get fixed. This is why GIBL offers accommodation facility under high-end roadside assistance program. You can claim as much as Rs. 5000 as hotel benefit under this service. Similar to the previous benefit, high-end motor insurance policyholders are also entitled to get airfare benefit at GIBL if their vehicles experience a major setback during a long distance journey. They can avail up to Rs. 5000 as airfare benefit. Roadside assistance is beneficial as it provides policyholders with availability of service. You have to pay for the fuel anyway regardless of whatever coverage you have. But, the coverage ensures prompt service. These days cars are a necessity and since car insurance is mandatory, it is wise to make GIBL your one and only insurance destination as it provides you with a myriad of roadside assistance services free of cost and saves your money that you otherwise would have spent for availing a roadside assistance add-on cover which is not as comprehensive as the one on offer at GIBL.